A few days ago we’ve pushed some UI changes to the Easy Blog Networks app. 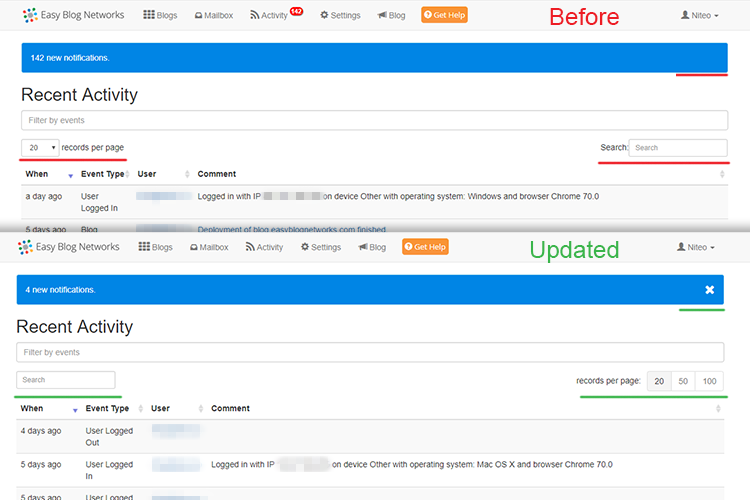 The goal of these changes was to polish the existing interface and to remove elements which we feel aren’t needed. To avoid any unnecessary confusion, we will review those changes one by one and explain our thought process behind it. Let’s start with blog list view. We’ve moved the “Add New Blog” button from the blog list table in the main section to the left panel on the top. We’ve also made it bigger so it is more convenient to click on it. 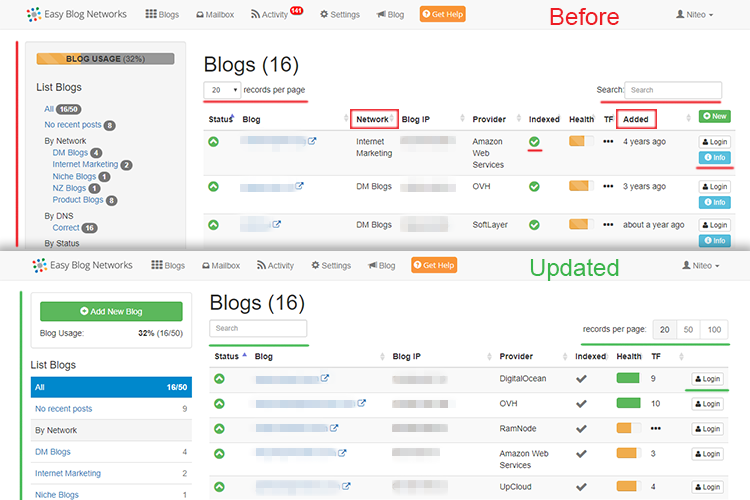 Below it, we’ve modified the look of the “Blog Usage” and “List Blogs” elements to match the updated look and feel. The information is still mostly the same except for one minor thing – we hide filters that only have one option. For example: If you have all your blogs with correct DNS, then we will hide “By DNS” filter, but if you need to update the DNS for any of your blogs you will see the “By DNS” filter. In the center of the page, we’ve swapped pagination and search because it feels more natural. We’ve also polished those elements. In the blog list table, we’ve removed the “Network” and the “Added” columns. “Network” information is already available in the left panel via the List Blogs filters and “Added” information is not that important to be shown on the blog list page. You can find this information in the blog’s Info Page. We’ve also removed the “Info” button in the last column of the blog list table because it had the same functionality as if you were to click on the domain link in the “Blog” column. So here we just removed duplicated functionality. The last two minor changes were to the indexation and health icons in order to make the design more consistent. On the Activity page, there was only one minor modification. We’ve replaced the “Mark all as read” button at the bottom with the “x” mark in the top blue notification on the right. This feels more natural because you don’t have to scroll to the bottom in order to mark all notifications as read. More changes will come in the next few weeks mainly to Blog View and Settings page. We will provide you with regular updates on our progress. We hope you like the changes, and if you require any further information, feel free to contact us.